Your judging me, aren’t you? Well you have every right to be. 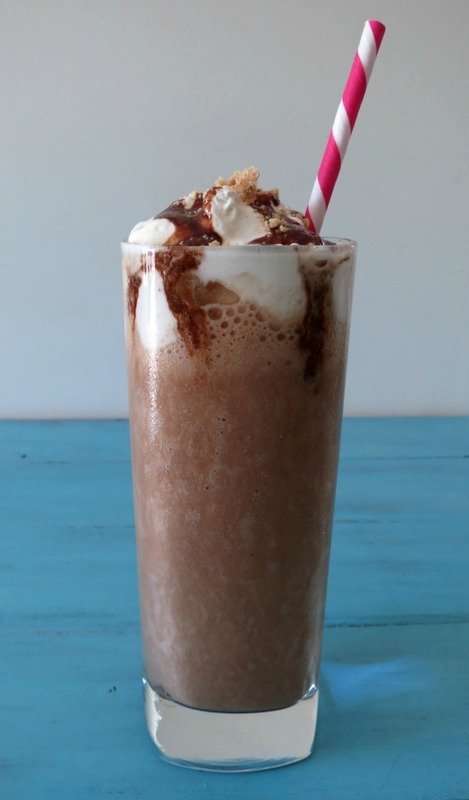 I have officially made a S’more frappe and I liked it! No cross that, I loved it!! I had a jar of Marshmallow Fluff that I couldn’t get it out of my mind. I knew that white fluffy goodness was waiting for me, it was calling me, and calling me a lot. Being a Saturday afternoon, I needed my afternoon frappe, not spoonfuls of fluff, well, ok maybe a few spoonfuls. So I made my a frappe and topped it with fluff! But I couldn’t just top it with fluff I needed chocolate syrup on it, after all it’s going to become a s’more frappe. Even better I happen to have a snickerdoodle cookie lying around, so I crushed it, crushed it till it crumbled, then I placed it on my coffee!! Who does that? I guess I do? I made my traditional Skinny Vanilla Mocha Frappe, and added a little bit of extra tender love to it. After all everyone and even coffee sometimes needs more love!! I whipped together the frappe and poured it into two glasses, after all I should share. I maybe a little crazy, but l I am a generous person. 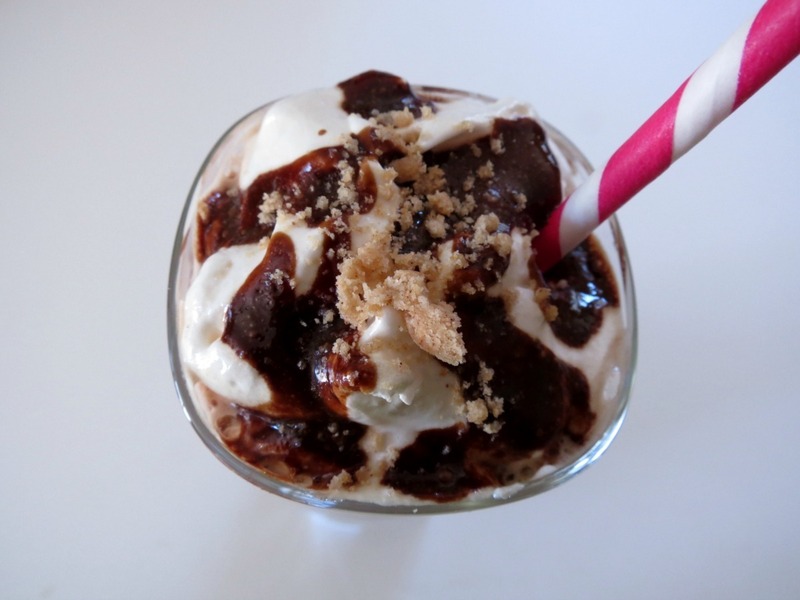 I then topped both frappes with heaping spoonfuls of fluff and drizzle of homemade chocolate syrup and crushed snickerdoodles. If you don’t have a snickerdoodle, a graham cracker cookie will do just fine. I went out to my Husband and handed him this glorious glass of goodness. His eyes popped, when he saw it! I don’t blame him! I ran back into the kitchen to make sure my dogs didn’t try putting their tongues into my drink. They try to do that, but I’m to quick for them. Since I was all sweetened out, due to the fact I ate a little to much fluff, I made my coffee a little less sweet. Please feel free to add a tad more cocoa powder to your drink or even some chocolate syrup. Everyone likes their drinks a little bit different. Honestly I don’t like my drinks to sweet, I save that for other things, like fluff and chocolate syrup. I know I need help! But I will tell you once you make your drinks and you swirl in your toppings, oh man is it good! I have to say the best part of the drink is when everything started to sink to the bottom. I got little chunks of cookie, sweet chocolate and a creaminess from the fluff. It was pure magic! 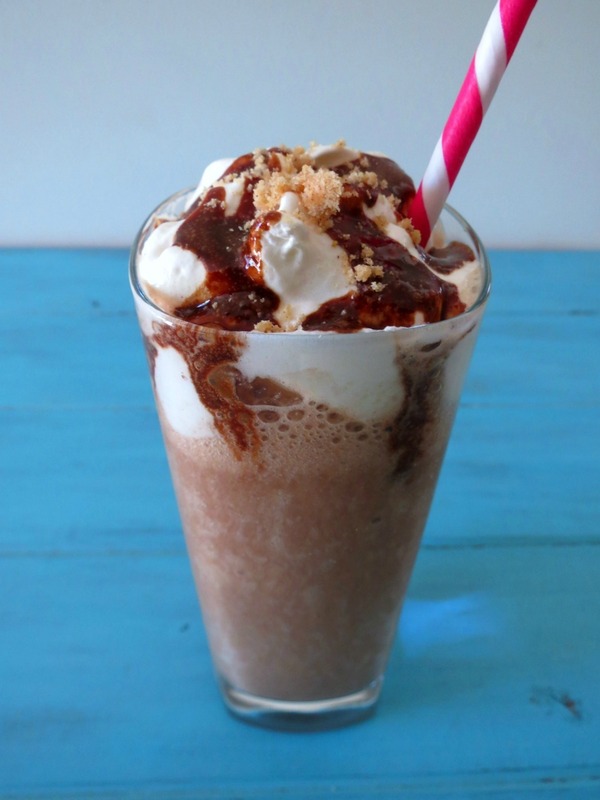 An ice coffee and chocolate blended drink topped with marshmallow fluff, chocolate syrup and crushed snickerdoodle. Place coffee, coconut milk, fat free milk, cocoa powder, vanilla extract, stevia, ice and xanthan gum in a blender. Process until combined. Pour into two cups, and evenly divide the marshmallow fluff and syrup between the two cups. Top with graham cracker crumbs or crushed snickerdoodle cookie. A few key notes when making this drink. 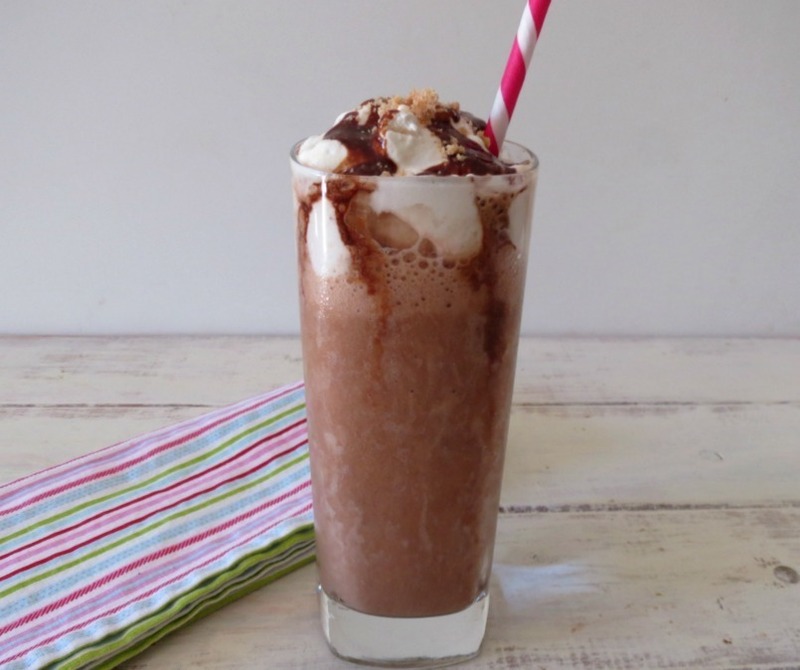 For the coffee, I have been keeping a pitcher of cold brewed decaf coffee in the refrigerator so it’s easy to make a frappe anytime you need one. I’ve been cutting back on the caffeine so I have been having the decaf. For the milk, I used part coconut and part skim milk because coconut milk, sometimes makes your drinks more icy then creamy, where as the skim milk takes away the iciness. However you can use whatever milk you please. It’s not necessary to use xanthan gum in your drink. I do this so it doesn’t separate plus it makes it thicker. You, my wonderful readers told me to do that! I love it, so I thank you. I didn’t include the snickerdoodle topping in my nutritional calculation, since I barley used any, and everyone’s cookies are different, but like I said graham cracker crumbs would work great too, especially since that’s part of a s’more. I just didn’t have any. Make due with what you got. Huh, after re-reading my post, I think I have a major sweet tooth right now. Hey, it’s still low calorie! I’ll trade you the frappe for some gelato! This literally has my mouth watering. Can’t wait to make this recipe soon!! This looks so good! It will be next on my “list” to make!!! If you make it, let me know what you think! 🙂 have a nice weekend! 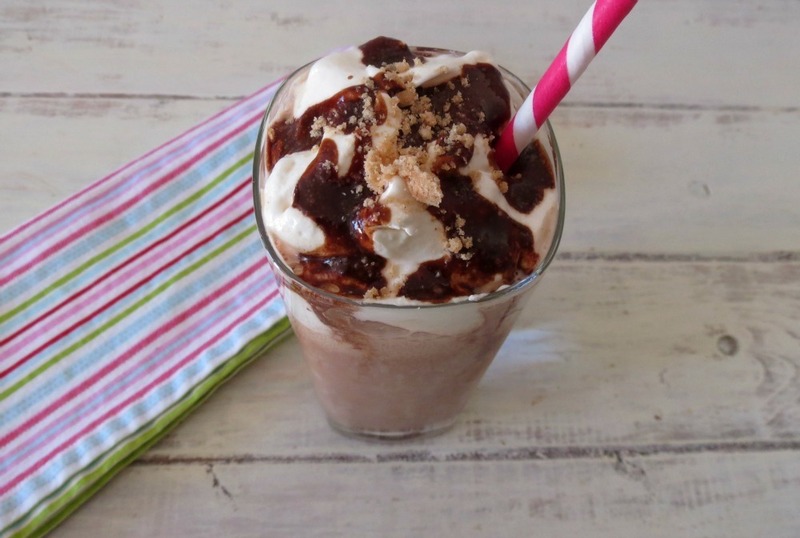 Love the idea of a s’more frappe! So yummy! I love that I have stumbled upon your page. I love it and all the food that is here. 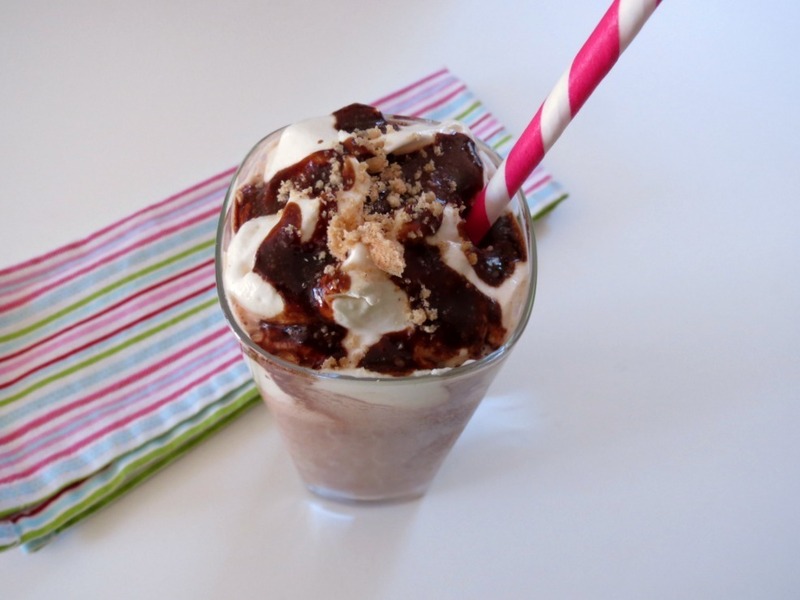 I do have a question…How or where can I find the recipe for Homemade chocolate syrup, sugar free? Thanks again for sharing your secrets with us.